Had a great week of meals influenced by others. Brinner is definitely going to be making a more regular appearance while the Salmon with Philadelphia and Pesto sauce was simple but very effective. Biggest hit however was the Thai Pork and Peanut Curry. Very quick and easy to throw together with an amazing flavour. An early Mothers Day dish on Friday when boy and girl decorated the top of my Cheesy Lentil Pie with Cornmeal Pastry. 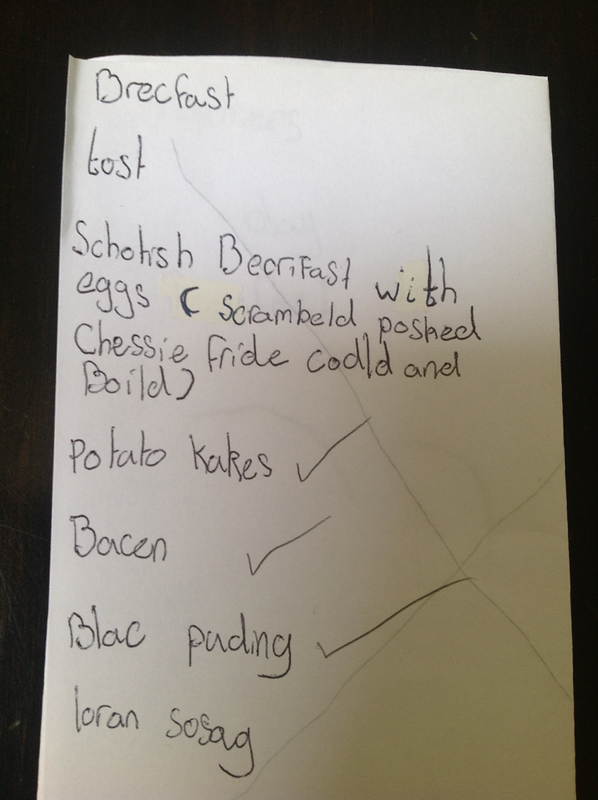 They also served me breakfast in bed on Mothering Sunday complete with a vast menu and cute spelling. I opted for the Potato Kakes, Bacen and Blac Puding. Definately not just for Burns Night. This will be a bit of a celebratory meal for boy and girl who were competing on Saturday in a School's Burns Competition and won Gold and Silver Medals. Boy will be reciting his winning "Address to a Haggis"
Beef meatballs with rice spines mixed through. Going to do them in the slow cooker with a tomato sauce. A friend posted a photo of this on Twitter and it looked fantastic. Risotto made with Orzo. Hope mine turns out as good as hers looked. Also got Pinnies and Petticoats Cake Club tonight for Comic Relief. No idea what I'm baking. This seems to have made an appearance on lots of menu plans over the last few week and I though it was about time it made it onto mine. Special request form Foodie Loon for me to make some of the dishes I learned on my Indian cookery course last year. Heading away to spend the night at High Seas Hobbit. Can't wait. 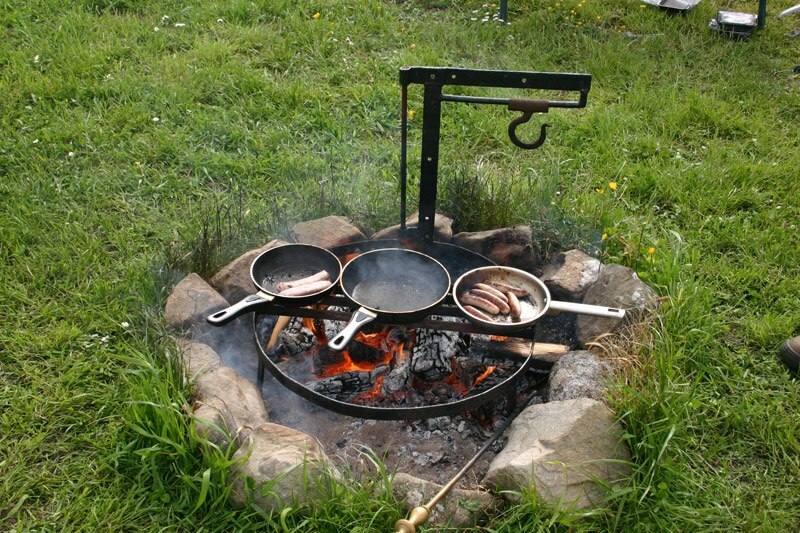 Whatever the weather we will be cooking al fresco on our Glamping adventure. 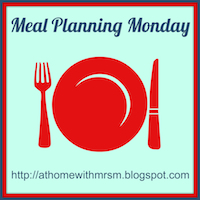 Enjoy your week no matter what's on the menu and head over to #mealplanningmonday with Mrs M for more inspiration. WOW Glamping! that looks awesome as does your week. I love haggis, definitely not just for Burns Night, enjoy :) I think that curry will be on my meal plan soon! 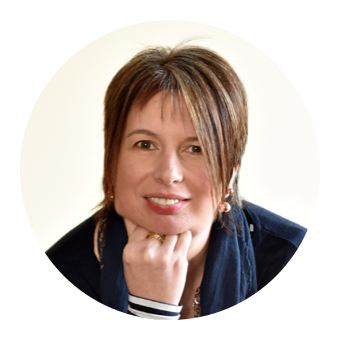 Ooh wow what a fantastic week you have planned! Great pics!! Love the mothers day menu! Too cute!! Just had to google Porcupine Meatballs...lol Wow! They look delicious!! Love the menu and the pie looks great. May have to give the curry a go. That menu is sooooo cute!!! I used to love meatballs with rice as a child, we called them hedgehogs though!! !